How heavily is Louisville leaning on Lamar Jackson? Week 6 on the college football schedule brought some surprises, advancing the story of the 2017 season on many fronts. There were upsets and fledgling contenders showing they should be taken seriously. Looking over the results, here are 10 key numbers from the past weekend. 327: Arizona lost starting QB Brandon Dawkins during the first series against Colorado. 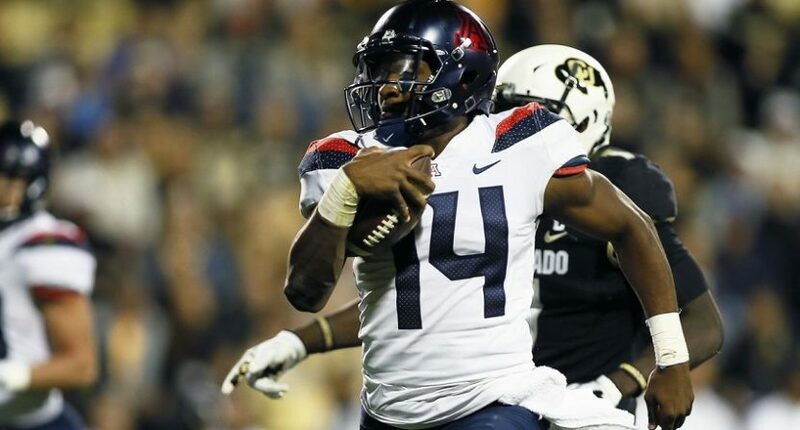 Backup Khalil Tate took over and to understate matters, he took advantage of his opportunity. The sophomore set the FBS rushing record with 327 yards and four touchdowns on 14 carries, leading the Wildcats to a 45-42 win. You read that right. 14 carries. Tate averaged 23.4 yards/carry. To toot our own horn, we predicted Arizona would do some damage on the ground. Colorado’s Phillip Lindsay had a pedestrian 281 rushing yards in a losing effort. 5: Michigan lost 14-10 to MSU. It was their eighth loss to the Spartans in their last 10 meetings. You don’t have to look too far down the stat sheet for the reason that happened. Michigan committed five turnovers. One first-half fumble set up the Spartans in Wolverine territory for a TD drive. A second-half fumble cost Michigan a chance at points before halftime. John O’Korn threw three interceptions during the second half. That’s no formula for winning. Credit Michigan’s defense for keeping it from being far worse. 44: The sharp money was on Florida State (+3) at home against Miami. The Hurricanes won and covered on a late touchdown, 24-20. The Seminoles largely controlled the box score from scrimmage. They had a +1.5 yards/pass advantage and a +1.8 yards/carry advantage. Sometimes, one special teams play can make an enormous difference. Braxton Berrios’ 44-yard punt return in the third quarter flipped the field, setting the Hurricanes up for a 21-yard touchdown drive to go up 10-3. That score made up the box score differential. Berrios also caught eight passes for 90 yards and two touchdowns. 13.6: For the seventh season in a row, Oklahoma has lost a game as a double-digit favorite. The Sooners were 30.5-point favorites at home. Iowa State beat them, 38-31. That margin puts it among the greatest ever college football upsets. Backup quarterbacks Kyle Kempt and now-linebacker Joe Lanning threw for 368 yards and three touchdowns on 27 attempts, besting Baker Mayfield. Not the most competent hour for the Sooners pass defense. Anyone trying to figure how this transitively relates to Ohio State should give up. 66: Speaking of Ohio State… the Buckeyes crushed Maryland, 62-14. It was about as emphatic a beatdown as one could deliver. Ohio State held Maryland, with help from 12 tackles for loss, to just 66 yards of total offense on 55 plays. The Terps averaged a balanced 1.2 yards/play through the air and on the ground. Maryland remains one of 2017’s most inscrutable college football teams. 72.6: LSU beat Florida 17-16. That’s about the scoreline most expected, going one way or another. Perhaps it was the absence of Les Miles and Will Muschamp. But this game had little weirdness. There were no turnovers in this game. There was no bizarre special teams play. Both the Tigers and Gators scored their points by methodically moving down the field. The average scoring drive length was 72.6 yards. Crucial win for Ed Orgeron. Stealing back one of their road games could be the difference between going to a bowl game and not. 11: Louisville ran 77 plays from scrimmage. Sixty-six of them ended up being a Lamar Jackson pass attempt or rush. Louisville running backs combined for 10 carries and one pass attempt. That’s not ideal ball distribution. That’s not how much Louisville wants to lean on their Heisman-winning quarterback. It is a testament to how much Louisville struggled against a formidable N.C. State front. 10/10: Fumbles cost field position and games. Good or bad fortune recovering them impacts the win-loss record. Virginia is off to a 4-1 start in Bronco Mendenhall’s second season. The Cavaliers have fumbled the ball 10 times in their first five games. They have recovered all 10 of them. However lucky they have been, the wins still count. If UVA can win just two of their next three – at UNC, BC, at Pitt – they are going bowling. 7: College overtime is entertaining. But it can get a bit ridiculous. Western Michigan beat Buffalo, 71-68, in football. Determining the result required seven overtimes. The teams combined to score 77 points after the end of regulation. Godspeed to anyone trying to read something into either team’s stats for the rest of this season. 1,178: Players who will be going pro in something far more important than sports provided some entertainment. Navy beat Air Force, 48-45, on a last-minute touchdown pass. Air Force had soared back to take a 45-41 lead after trailing 31-10 in the third quarter. The teams combined for 1,178 yards of total offense. Air Force even added 281 yards deploying the forward pass.